These two boys are friends of ours. 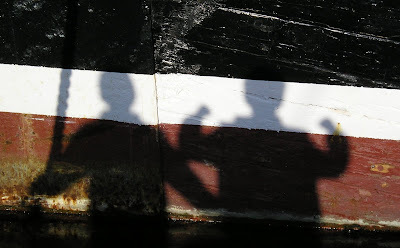 We were walking along a dock one winter's day and they noticed their shadows on the side of a boat. I've known these boys all their lives and this picture captures their personalities so well. It takes me right back to that day and how much fun they were having. Shadow pictures are always fun! Sounds like a wonderful memory was captured in this photograph! oh that is a nice photo of your friends' shadow.nice job. Hope you check out mine too! Nice shot, great idea for a photo. Love the shot, that's a framer! You have an incredible eye. It's awesome!